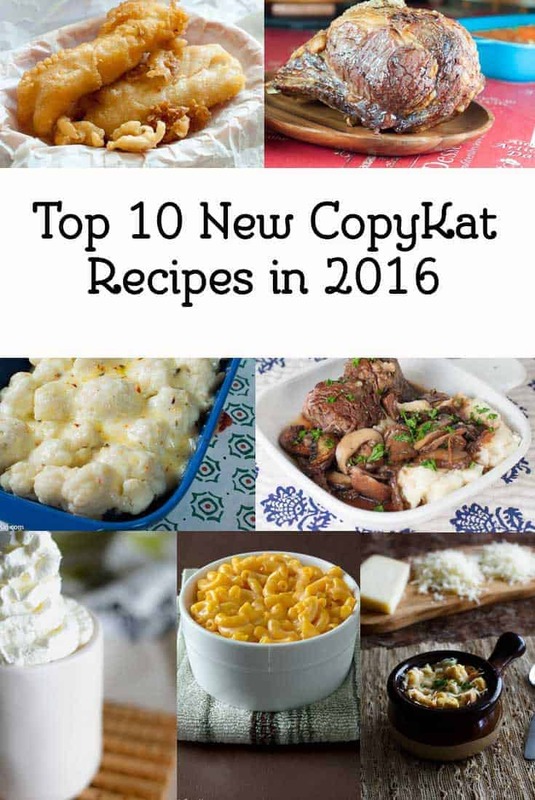 Here are my top 10 NEW recipes of 2016 on CopyKat.com. So these are the recipes that were created this year, and these are the ones that you enjoyed the most. How do I know you enjoyed the recipes the most? By the times you came and viewed the recipes. 10. Long John Silver’s Chicken Planks – Recreate these crispy chicken tenders with this recipe. While Long John Silver’s isn’t around as much as they used to be, you can enjoy these chicken planks anytime now with this recipe! 9. Longhorn Steakhouse Parmesan Coated Chicken Breast – Longhorn Steakhouse makes many different great dishes there, and it is not just about steak. 8. How to Make Beef Tenderloin in the Oven – Making a beef tenderloin can be expensive, learn how to do it right. When you prepare them correctly you can make sure you get your monies worth. 7. Cracker Barrel Mushroom Braised Pot Roast – Cracker Barrel makes some delicious pot roast. You can prepare this pot roast in your Instant Pot or slow cooker. Dive right into this delicious pot roast. 6. Starbucks White Chocolate Mocha – Recreate one of your favorite Starbuck’s coffee treats at home with this easy recipe. 5. Panera Bread Bistro French Onion Soup – You may not live near a Panera Bread, but you can recreate their French Onion Soup at home with this easy recipe. 4. How to Cook a Ribeye Roast – Ribeye Roasts are simply delicious. You can learn how to make one at home that will rival any you will get away from home. Demystify in how to make a roast. 3. Instant Pot Macaroni and Cheese – You can make delicious macaroni and cheese inside of your instant pot. Creamy and delicious macaroni and cheese can be made in the Instant Pot. 2. Long John Silvers Fish Batter – You can make fried fish just like Long John Silvers. It isn’t hard to do at all. Best of all you can fry onion rings, or any type of fish you desire with this copycat batter. 1. Cauliflower Au Gratin with Monterey Jack Cheese – This year my most popular new recipe wasn’t a copycat recipe at all. It was a simple cauliflower recipe that is to die for. Check out the newest recipes of 2018. Thank you for all the RECIPES that you share! Absolutely divine RECIPES that you shate. Thank you for these fabulous favorites and your videos. I live in rural Florida and enjoy all my restaurant favorites that are not even here! Your recipes are so easy to follow and they always taste so great. Keep up the wonderful cooking you do. Thank you,, you make cooking so easy………..for me. Thanks for this list! I’m here for the first time, and got at once the most popular recipes, that’s nice! Suppose to check most of them. Nothing to say except you’re the best! Both CopyKat cookbooks are truly my number one go to out of dozens and dozens, oh and more dozens of cookbooks! Thank you every so much! Happy New Year and Happy Recipe-en.